This option includes everything you get with the Developer PLUS everything below. 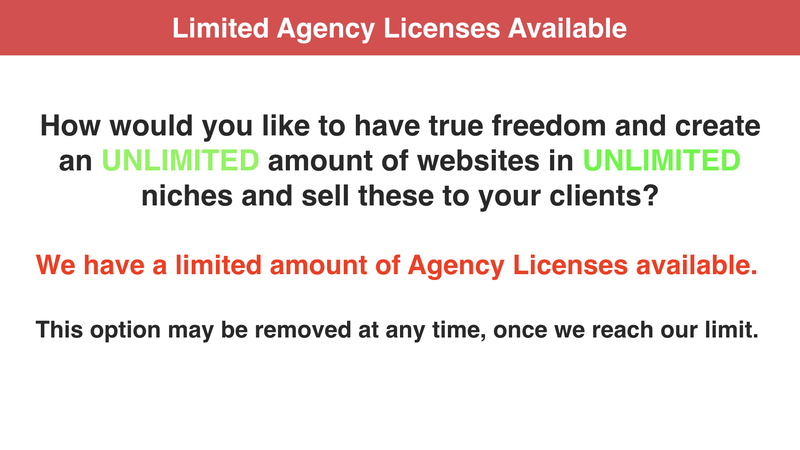 Should you wish to have true freedom and create an unlimited amount of websites in unlimited niches and sell these to your clients, we do have a limited amount of Agency Licenses available. This option may be removed at any time, once we reach our limit. You get unrestricted access to absolutely everything Store Buildr has to offer. You can create and sell an unlimited amount of Store Buildr sites in any niche. You will receive priority support from our dedicated support manager. You get even more opportunities to earn a lot more income and grow your business. You are only limited by your own imagination, allowing you to grow your business exponentially. With an Agency license you can command a higher fee by creating websites on request for your clients. Store Buildr Agency License Terms. Any websites you sell must be installed on a domain that either you or your client owns. You may NOT re-sell or share the ‘raw’ website, script or any of its contents in any way. You must first create a unique website for your end user (your customer). [YES] Can create and sell unlimited websites in any niche. [YES] Websites you create can be edited by yourself or your end user (your customer). [YES] Websites you create can be sold on auction sites. [YES] Can change the niche of any website. This means you can create websites in any niche. [YES] Websites can be sold for any price above $9.95. [YES] Websites you create can be offered as a bonus, as long as it's for a product higher than $9.95 in price. [YES] Can create sites for clients as part of a training package or membership higher than $9.95 in price. [NO] Websites you create cannot be given away for free. [NO] Websites cannot be packaged into bundles. [NO] Cannot sell Private Label Rights or Resale Rights to any websites you create. [NO] Cannot offer the raw website file for download. IMPORTANT! You can sell an unlimited number of sites while you maintain an active Agency membership. Should you cancel your Agency membership then the above license terms will be revoked. Existing sites that you have sold can still remain active, but you will be responsible for maintaining active support & updates. If you are unsure of any license terms or have any questions, please contact us. Yes Guys, I am Ready to Take my Business to The Ultimate Level! Payments are made through JVZoo, a secure online retailer. As soon as you have purchased, we will send you your download details instantly. One Time Only Payment - Nothing More to Pay!